There are many ways to construct an ecosystem model. The program uses models in the format of symmetric table from a spreadsheet. 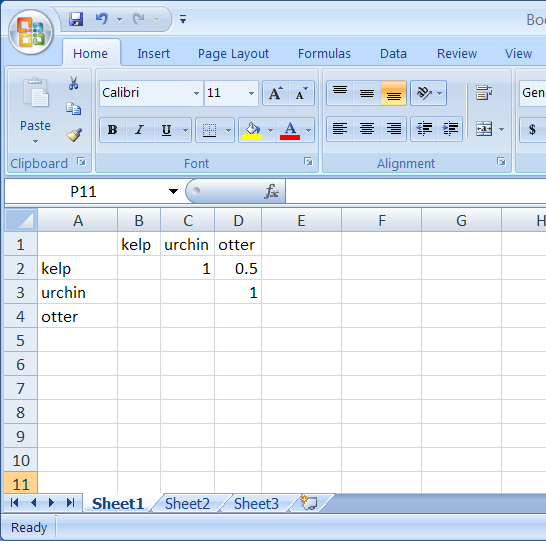 At the current time, the table must be saved as a csv file. To import from a .csv file, click Import and browse to select your .csv spreadsheet. For example, the term kelp may be used to represent one ecosystem component, or you may choose to represent this component with the terms of kelp, seaweed, plant, in which case each term should be listed (no “or” is necessary). Boolean search capabilities are included. Fill in cells with linkage values from zero to one for the top right side of the table.